Sunday, May 4th: Fresh Bucks Returns Today! Plus Westside Asparagus, Turnips, Frilly Mustards, Green Garlic, Tuna & Gifts Unique For Mom! Happy May, good people of Ballard! We survived the anarchist uprising for one more year… apparently because they couldn’t agree on what they were protesting about… and tomorrow, all of America, and one small state in Mexico, will celebrate an unlikely military victory 150 years ago by eating guacamole and drinking mas Dos Equis. Woohoo! But the beginning of May is actually significant for one much more important occurrence: the return of the Fresh Bucks program! That’s right! If you receive SNAP/EBT benefits (a.k.a., Food Stamps), and you use them to buy groceries at your Ballard Farmers Market, we will match your SNAP dollars, up to $10, with Fresh Bucks coupons good for fresh, local fruits, vegetables and fresh-cut herbs from our vendors, once per visit, every week, through December! Would you like to help us expand Fresh Bucks? 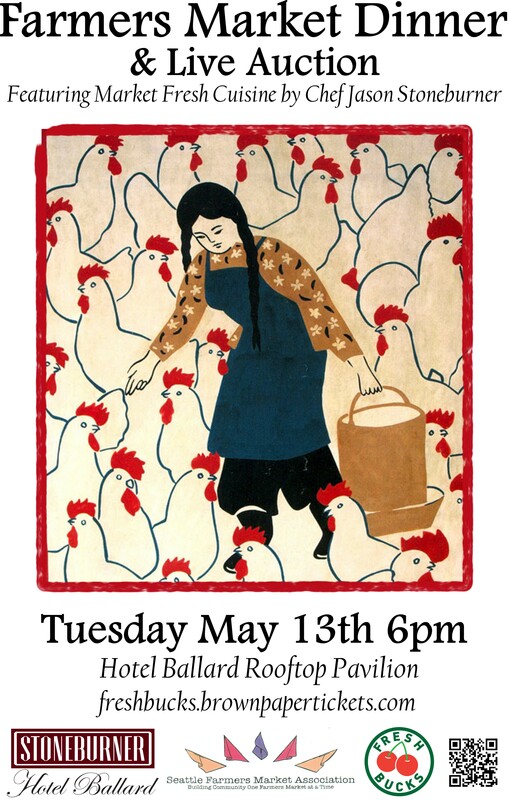 Please buy a ticket to our Farmers Market Dinner & Live Auction to Support Fresh Bucks on May 13th, or simply make a donation now! Your generosity will help us create educational programming for kids about cooking with and eating farmers market produce, and to extend this great program into the winter months. And hey… the Farmers Market Dinner & Live Auction makes a great Mother’s Day gift! Another reason to celebration the first Sunday in May is tuna! Yup, Fishing Vessel St. Jude makes its monthly visit to your Ballard Farmers Market today. Stock up for the month with some of these gorgeous portioned frozen albacore tuna loins, some canned albacore, smoked or even jerkied! This is the finest, sashimi-grade albacore available! Japanese wax turnips from Alm Hill Gardens. Photo copyright 2013 by Zachary D. Lyons. If you don’t know how much I love radishes, you have not been paying attention the last several weeks. And you know what I love almost as much as radishes? These lovely, little Japanese wax turnips! They are sweet and spicy, great sliced like radishes and added to salads, or sautéed in some nice butter, and their greens are edible, too, meaning you get two veggies for the price of one! In fact, you can do a very quick sauté of the greens, and then top them with the sautéed turnips for a beautiful presentation of deliciousness. You’ll find them, as well as some of that famous purple-tipped asparagus and more, at Alm Hill Gardens today! Squash blossoms & baby squash from Colinwood Farms. Photo copyright 2011 by Zachary D. Lyons. 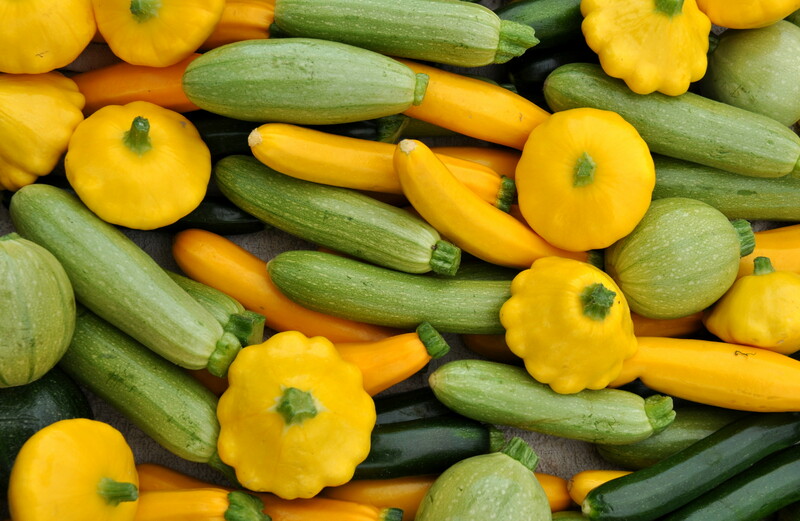 Last week, we talked about adorable little baby summer squash from Colinwood Farms. Today, let’s talk about squash blossoms. Fill these puppies with some from fresh cow, goat or sheep cheese (all available right here at your Ballard Farmers Market! ), and fry them up! Hey, now that sounds like a great way to celebrate Mexican military good fortune tomorrow, eh? 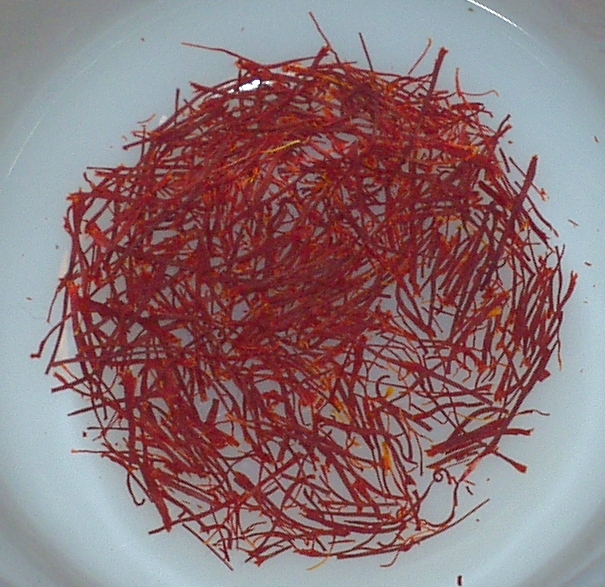 Washington-grown saffron from Phocas Farms in Port Angeles. Photo copyright 2009 by Zachary D. Lyons. Over the last couple of years, our buddy Jimmy at Phocas Farms only had enough of his prized saffron to supply just a handful of local chefs. But his 2013 harvest was a good one, and he has a limited number of packets of saffron for you and I right here at your Ballard Farmers Market! Jim harvests these saffron threads on his farm in Port Angeles every October, when their crocuses bloom. It is meticulous, painstaking work from dawn to dusk during the harvest, as each thread must be harvested right when the bloom begins to open. It is no wonder this spice is so precious. And you will find no better saffron anywhere on earth! Golden Frills mustard greens from One Leaf Farm. Photo copyright 2014 by Zachary D. Lyons. These are the aptly named Golden Frills mustard greens from One Leaf Farm. Frilly indeed! And they pack a tasty little spicy kick, too. One Leaf also has the first pea vines of the season today at your Ballard Farmers Market, and the return of pink beauty radishes! Spring garlic just harvested at Nash’s Organic Produce. Photo courtesy Nash’s. And the hits just keep on coming! (Yes, I am still giddy about spring!) This is spring garlic from Nash’s Organic Farm. Spring garlic is quite simply one of the most delicious things Al Gore ever invented, but it is only available for a short time each spring. Use it much like a spring onion in sautés, roasts, on the grill — heck, I like to cut it up with spring onions, asparagus and morel mushrooms, toss them with some nice olive oil, and roast them all together in a hot oven until just tender. It is so sweet and mild this time of year. Green garlic is a byproduct of garlic production. When farmers plant garlic in the late fall, they plant way more than they hope to harvest and cure come summer. That way, if some fails, they will still have plenty. In the spring, as the garlic begins to grow with gusto, they thin it out to allow the remaining plants’ bulbs to fill out comfortably. We get to enjoy the thinned plants as spring garlic. You can use the entire plant, from root hairs to the tips of the greens. Organic vegetable starts from Stoney Plains Organic Farm. Photo copyright 2014 by Zachary D. Lyons. Planting your own vegetable garden this year? Well, the start of May also means it is time to get that going in ernest. Stoney Plains Organic Farm has a terrific selection of certified organic vegetable starts to facilitate you in that endeavor. Stop by today and load up, and then eat from your own backyard farm this summer! Spa Day Gift Box from Brown Butterfly. Photo courtesy Brown Butterfly. Hey kids! Mother’s Day is next Sunday! Don’t be the schlump who didn’t take care of your mom! You can start with a Spa Day Gift Box from Brown Butterfly Aromatherapy. Everything they make is all natural and gentle, and their soaps, lotions and creams come in a variety of exhilarating scents. Mom will be happy. And when mom’s happy, everyone is happy! Herbal teas from Harbor Herbalist. Photo copyright 2013 by Ben Chandler. Mom’s love herbal tea, too! And Harbor Herbalist makes an almost dizzying variety of herbal teas, most of which are caffeine-free. They are formulated using different combinations of herbs that offer a broad spectrum of medicinal and flavor profiles. Why not pick up a bag or three this week for mom, and greet her next Sunday morning with a lovely cup of herbal tea, before you take her down to her favorite farmers market, right here in Ballard, of course! Non-toxic, natural candles from Cherepashka Candles. Photo copyright 2014 by Zachary D. Lyons. Mom’s also love candles, and these non-toxic, natural candles from Cherepashka Candles will lift mom’s sprits without asphyxiating her on the candles fumes. See, you’ll be telling your mom you love her… twice! Beautiful flower bouquets from Children’s Garden. Photo copyright 2014 by Zachary D. Lyons. And just a reminder that you will not be the only one next week who wakes up and thinks, “Hey, I oughta get some flowers for mom from one of the many great farms at my Ballard Farmers Market!” Plan on long lines, and don’t wait until the end of the day. These tips will lower your stress level, and will keep you in good standing with the woman who brought you into this world. Gluten-free cupcakes from nuflours. Photo copyright 2014 by Zachary D. Lyons. Finally, nuflours gluten-free bakery has a new line of cupcakes! This little bites of gluten-free heaven will satisfy even the least sensitive to gluten person in your household. On the left, we have lemon-coconut cupcakes, and on the right, chocolate-chocolate cupcakes. I call dibs on that one in the second row on the right! Sunday, April 13th: Yeah, It’s Spring! Woohoo!!! Organic asparagus from Alvarez Organic Farms. Photo copyright 2012 by Zachary D, Lyons. It seems only appropriate that I am listening to the song Sirius, by The Alan Parsons Project, as I begin writing this week’s epistle on all things Ballard Farmers Market. Thinking about the onslaught of spring, a warm, sunny, 70-degree day today, and a Market full of all sorts of fresh spring produce, I feel kinda like I’m watching my team come out of a timeout, on the brink of a come-from-behind victory in a packed home arena! And I know that this is just the beginning of many spectacular weeks and months to come. For instance, we last saw Alvarez Organic Farms last December on the coldest Sunday of the year with a last few fall crops. Today, they return to your Ballard Farmers Market with their amazing organic asparagus, and the promise of so much more deliciousness to come! Purple sprouting broccoli from Nash’s Organic Produce. Photo copyright 2013 by Zachary D, Lyons. And while we are celebrating spring, and perhaps still, the Seahawks, I am going to toast my beloved Union College men’s hockey team for winning the NCAA championship Saturday night by grilling up some of this amazing purple sprouting broccoli from Nash’s Organic Produce tonight alongside a nice pork chop from Olsen Farms. I wish I was in Schenectady going nuts with the masses, eating the best Buffalo wings on earth and drinking Matt’s Premium, but this will have to do. You know, Passover begins tomorrow, and Easter is just next Sunday. Be you Jewish or Christian, you will need lots of eggs! Lucky for you, we have lots of eggs right now at your Ballard Farmers Market. Like these gorgeous, certified organic duck and chicken eggs from Stokesberry Sustainable Farm in Olympia. So, whether you are making a seder plate or dying and hiding them, we’ve got you covered! Pink Beauty radishes from One Leaf Farm. Photo copyright 2013 by Zachary D, Lyons. Almost as exciting as this gorgeous spring day, Union winning championship and the spring high holy days is the return of radishes! Okay, I admit it. I am just as excited about radishes! I have sooo missed them all winter long. They are one of my favorite things. And one of my favorite radishes is the Pink Beauty radish from One Leaf Farm. I can eat them like candy, and my salads are so much happier with their return. Did I mention I am excited about spring yet? Spicy salad mix from Alm Hill Gardens. Photo copyright 2013 by Zachary D, Lyons. Salad mix pots from Pam’s Place Plants. Photo copyright 2014 by Zachary D, Lyons. Hey condo dwellers! Check this out! These are pots of salad mix. That’s right! Pick up one or two of these guys from Pam’s Place Plants, set them in your planter box or on your little deck or porch, and you can harvest your very own salads. How cool is that? Brighten up your home with some beautiful spring flowers from Choice Bulb Farms, or pick up some bulbs from them to plant to enjoy later in the year. Choice returns today to your Ballard Farmers Market after its winter hiatus with flowers you will not likely see anywhere else! Organic, pasture-raised beef brisket from Skagit River Ranch. Photo copyright 2014 by Zachary D. Lyons. Speaking of Passover, if you are in charge of the brisket, check in with Skagit River Ranch today! Of course, if it is ham you need for Easter, Skagit River Ranch has you covered there, too. They have lots of hams, and they are righteous! Hot Cross Buns for Easter from Grateful Bread Bakery. Photo copyright 2011 by Zachary D. Lyons. It seems like it is just about time for Grateful Bread Bakery to break out the Hot Cross Buns as we head into the Holy Week, and maybe, if we’re lucky, a few Easter egg and Easter bunny cookies, too!